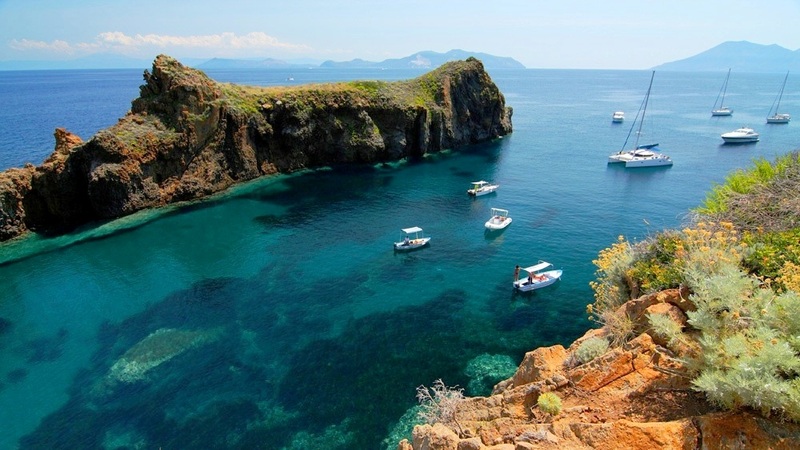 Panarea is the second smallest of the Aeolian Islands, a group of volcanic islands lying off the North coast of Sicily. Now it is a popular tourist destination thanks to its beaches and landscapes, and is well equipped. The beach is located in San Pietro, on the East Coast, and is well equipped, there is also a small harbour for ships, speedboats and fishing boats. Between the beaches of Panarea Island Cala Junco, most notably in the South of the island and is accessible by sea or by land along a trail leading to the beach. Along the road to Cala Junco you can also reach the beach of Cala degli Zimmari. These are the only two beaches accessible by road. The small Harbor hosts ferries departing for Napoli and Milazzo. Do you want to travel with your family to get to Panarea? Do you like adventure and freedom and you want to reach the destination Panarea with your moto ? These are the shipping companies that serve the routes to Collegamenti Interisole, Ustica Lines-Liberty Lines, Snav.